In an interesting twist, Kentucky Sen. Mitch McConnell is under fire from his Democratic opponent, Alison Lundergan Grimes, for “personally” taking “$600,000 from anti-coal groups.” But where did most of this alleged “anti-coal” money come from? Wells Fargo. The bank. McConnell’s wife, Elaine Chao, the former secretary of labor under President George W. Bush, sits on the Wells Fargo board of directors — for which she has been paid $684,000 over the last three years — and Wells Fargo has initiated a policy to limit its involvement with coal companies that do mountaintop removal. But to call Wells Fargo an anti-coal group is a huge stretch. For one, it still lends billions to coal companies. The environmental Sierra Club gave it a “D” rating this year for its involvement in financing coal-fired power plants in 2013. Moreover, the decision to limit involvement with companies that do mountaintop removal was made five years before Chao joined the Wells Fargo board, and company officials say the board of directors had nothing to do with that decision. Besides, Chao’s compensation from Bloomberg Philanthropies makes up just a fraction of the $600,000 highlighted in the ad. Records show Chao receives $9,400 annually for serving on the advisory board. Not mentioned in the ad is that the lion’s share of the $600,000 in question relates to Chao’s compensation for serving on the Wells Fargo board of directors. Proxy reports from 2012, 2013 and 2014 show that Chao received fees and stock awards totaling more than $684,000 for her role as a company director starting in 2011. In its annual report on Environmental and Social Risk Management, the company said it recognizes the “controversy” surrounding coal mining through mountaintop removal. Wells Fargo Report on Environmental and Social Risk Management, 2013: Mining of coal and metals can generate significant economic benefits to local communities by providing jobs in rural areas, or in developing countries, where few other employment or economic development opportunities are available. However, coal and metal mining present significant concerns and impacts. In particular, the surface mining practice known as mountaintop removal (MTR) mining has drawn considerable attention and controversy. Wells Fargo Report on Environmental and Social Risk Management, 2013: We carefully consider companies who are engaged in surface mining in the Appalachian region of the United States. We recognize the significant concerns associated with this practice and we also acknowledge the significant investments made by our coal customers in their mine operations, which were entered into in good faith and in accordance with applicable regulations. As a result of our deliberate approach and the broader movement of the industry toward other mining methods, our involvement with the practice of MTR is limited and declining. Wells Fargo will not extend credit to individual MTR mining projects or to a coal producer that receives a majority of its production from MTR mining. Does that make Wells Fargo an “anti-coal group”? In the 2014 Coal Finance Report Card published by Rainforest Action Network, the Sierra Club, and BankTrack, the groups applaud Wells Fargo for taking “steps to reduce their exposure to the coal industry by phasing out financing relationships with the largest producers of mountaintop removal coal.” Due to that, Wells Fargo was one of two U.S. banks to receive a “B” grade for its policies and practices with regard to financing mountaintop removal (even as the report noted that in 2013 Wells Fargo “provided $81 million in financing as a lead arranger or lead manager in transactions with MTR coal producers profiled in this report”). Dunn, Oct. 6: In 2006, Wells Fargo adopted a credit policy that provided guidance related to financing coal and metal mining. While we continue to finance coal companies, as a result of our deliberate approach and the broader movement of the industry toward other mining methods, our involvement with the practice of MTR is limited and declining. This policy was developed by the lines of business and did not involve members of Wells Fargo’s Board of Directors. Given that we still finance coal companies, we would certainly not characterize ourselves as “anti-coal.” And it should be noted that we reached this decision five years before Ms. Chao joined our Board. So the ad’s claim that McConnell and his wife “personally took $600,000 from anti-coal groups” is tenuous indeed. But even if it were true, one might ask what it has gotten them from McConnell. Bill Bissett, president of the Kentucky Coal Association, has told us: “Senator McConnell and his staff have done everything they can to support Kentucky’s coal miners and coal production.” Bissett told us only about 2 percent to 3 percent of Kentucky’s coal production comes from mountaintop removal, and a permit hasn’t been issued for new mountaintop removal in Kentucky since 2002. Moreover, McConnell has received more political contributions from coal mining interests — more than $202,000 — than any other senator, according to the Center for Responsive Politics. 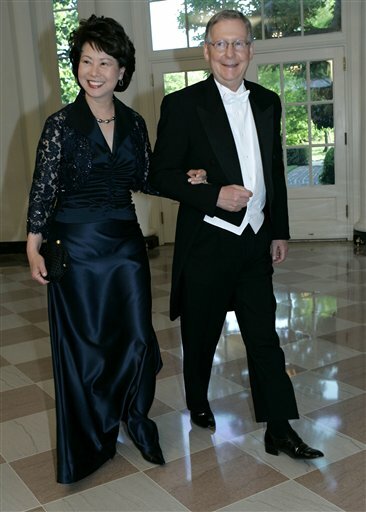 And for the record, the photo in the ad that appears to show McConnell, Chao and Bloomberg hobnobbing together in formal wear was digitally altered. Here’s the original, with just McConnell and Chao.